The calendar cannot be made available for the parents until the school administrator tells the system which school(s) are assigned to the calendar. • After you click Close on the Calendar, you’ll return to the Home Screen. 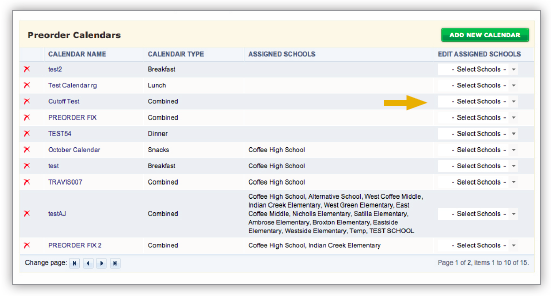 • Next to the Calendar you wish to assign, click the “Select Schools” drop down menu. • Under the list of Available Schools, place a check next to the school(s) you wish to add the calendar to. • Click Save on the checklist dropdown window.